A frontiersman on a fur trading expedition in the 1820s fights for survival after being mauled by a bear and left for dead by members of his own hunting team (IMDB). WOW WOW WOW!!! Just give this movie the Oscar already. 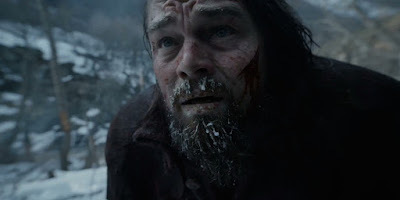 Inspired by true events The Revenant is the story of the extreme lengths a man will go to for the love of his family. Filmed in the wilderness, the actors and crew of this movie had to face the unpredictable weather and elements which made for very tough filming which resulted in a masterpiece of a movie. Although the movie was quite long it held my attention from start to finish and was action packed. DiCaprio and Hardy were outstanding in their roles and I truly hope the Oscars go to them for actor in a leading role and actor in a supporting role. The Revenant is a movie you do not want to miss seeing on the big screen for its stunning cinematography. What this man goes through and survives is just mind blowing and this one definitely receives 5/5 from The Crypt.